Debbie Krause is a Central Florida herbalist with a passion for plants, healing and medicine-making. 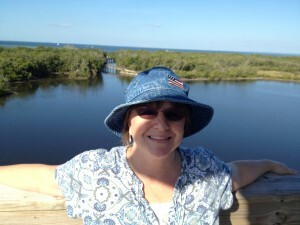 She graduated with a degree in Environmental Studies from Rollins College’s Hamilton Holt School in 1994 and has had a passion for nature and a connection to nature ever since. One of her greatest joys is wandering through the woods here in Florida or up in the mountains of North Carolina. Debbie began her formal herbal training at the Florida School of Holistic Living and completed the Community Herbalist training under Emily Ruff’s skilled guidance. She has continued her training with a variety of esteemed herbalists including Kim Ellis, Margi Flint, Jody Noe, Phyllis Light, 7Song, Thomas Easley, Michael Cottingham, John Gallagher, Rosalee de la Foret, Sam Coffman and Steven Horne. While Debbie appreciates every aspect of herbalism, she has a true passion for medicine-making. You can often find her in the kitchen working with fresh roots, creating tinctures and formulas or making her well-known “Deb’s Super Salve” first-aid salve and lip balm. She takes a lighthearted approach and loves the fun, messy nature of herbalism and the cast of characters that has become a core part of her life. She also enjoys teaching others how to take their own health and the health of their families, communities and environment into their own hands. Dr. Jody E. Noé obtained her Doctorate of Naturopathic Medicine from Bastyr University in Seattle, Washington. Previous to this, she was awarded her Bachelor’s and Master’s of Science degrees from Old Dominion University in Norfolk, Virginia. Dr. Noé served as adjunct faculty to the University of Bridgeport College of Naturopathic Medicine, Quinnipiac University, Connecticut College of Naturopathic Physicians, Bastyr University, the New England Women’s Herbal Conference, Northwest Institute of Acupuncture and Oriental Medicine (NIAOM) and several community colleges and private organizations. A founding member of the Botanical Medicine Academy, Dr. Noé is president emeritus for both the Oklahoma and Vermont Associations of Naturopathic Physicians. In addition to Family Health Care, Dr. Noe’s areas of specialization include integrative oncology, HIV/Aids and chronic disease. In all instances, Dr. Noé works to facilitate integration of mind, body and spirit, which requires patient participation in their own healing process. Leann Hill is an herbalist in Orlando, FL. She has been learning about herbs her whole life, but only formally studying since 2010. She has many varying interests including music, cooking, and history, and she tries to incorporate these into her herbal practices. She has been honored to be able to study under herbalist Emily Ruff as well as other various herbalists who teach at the Florida School of Holistic Living. She also writes weekly articles at www.BatLadyHerbals.com and relishes the chance to learn as much as possible about the wonderful world of herbs. Shannon Lockhart is a Mother, Folk Herbalist and light-worker. As a healer, her passion in life has become empowering others by helping them learn how to be responsible for their personal health and well-being. With such a busy life and being mindful of the fact the she is human and not immune to the external stressors in our world, Shannon decided to implement yoga into her daily routine. After attending yoga regularly, she was pleased with how yoga helped her off the mat in every aspect of her life. Having crossed paths with a wonderful teacher by the name of Tymi Howard and feeling blessed to be a part of the beautifully spirited community of like-minded individuals she helped grow, she was in Love! Shannon soon decided she wanted to deepen her practice and began teacher training the following summer. Shannon has been teaching yoga ever since and is truly humbled by the opportunity and experience. Allowing yoga to take a key role in her life has been essential as it has opened doors to new positive opportunities, new friends, and most importantly opened her heart! Shannon wants to share her passion and love for yoga with others, knowing it will have many positive effects in their lives as well. Stephen Kane is a passionate teacher, with a master’s degree in education he spent many years inside the classroom. He currently works at Bok Tower Gardens as a Garden Educator. His lifelong love of plants has taken him many interesting places as he continues to answer the call of the plants. His passion is ethnobotany, especially man’s call from the natural world to be in balance with the earth. He is a earth-skills practitioner learning and teaching others valuable lessons of survival living. He is blessed to learn from Emily Ruff and all the amazing teachers at the Florida School of Holistic living where he completed the community herbalist program. Stephen shares his life with his wife Sara and we are most proud of our two children who continue to teach and inspire us. food. This fascination for plants continued into adulthood and has turned into a long life passion. For 12 years Ghita had a small natural body care business where she created all kinds of herbal products for people to care for their bodies in a healing and holistic way. Later in life she returned to university to finish her degree in Plant Sciences with the intent to protect the plants and the knowledge of people connected to these healing plants for future generations. Ghita also spends her summers abroad in Spain with forays into France, Portugal and elsewhere learning about the useful plants of these areas and connecting with others that have roots in the botanical world. practicing traditional medicine for many generations and she is a member of both Cherokee and Miscogee creek traditional communities. Coming from a family of farmers and orange growers her relationship with plants began early. She spent several years living “off the grid” on a barrier island in south Florida where she raised her oldest son and became immersed in sustainable living practices. She is passionate about sharing her knowledge of “living lightly” on the planet and has been asked to help design sustainable curriculum for local schools. but where her heart truly lies is in peace with Mother Nature and all her plant allies. After high school, she wanted to forgo college and instead begin down her herbal path, hoping to travel to North Carolina and work with Juliet Blankespoore at the Chestnut School of Herbal Medicine. It was not until the beginning of 2013, however, that the world of herbalism opened up to Ari. After becoming incredibly ill, and healing herself of her ailments with the aid of locally foraged plants and fungi, she knew that in order to be truly healthy, happy and whole, she needed to finally take the Green Path to becoming an herbalist. Ari began making her own healing tinctures, salves and herbal infusions through self-study, and began her own small business called Valley Green Herbs, which she still runs today. In 2015, Ari went to her first Florida Herbal Conference, an event that changed her life in so many amazing ways. She got to meet, work with and learn from countless inspiring herbalists, among them was the ever inspiring and radiant Emily Ruff, Bob Linde, Joanna Helms, keynote speaker and noted herbalist Steven Foster, and the lovely Juliet Blankespoore herself. Being immersed in the world she loved fueled Ari’s passion for healing and her life has never been the same. Since then she has continued learning and expanding her lovingly made herbal products, received a certificate in Traditional Mexican Medicine (Curanderismo) with Eliseo “Cheo” Torres from the University of New Mexico, has travelled to the 2016 Florida Herbal Conference to meet Paul Stamets and continue her education, and now teaches classes on herbalism and healing to those who want to learn form the comfort of her own home in Havana, Florida. Heather has been an educator for 22 years beginning as a classroom teacher and then a case manager for a research project jointly run by pediatric neurology and education at the University of Florida. She later became an independent consultant, presenting at local and national conferences and providing training, coaching, and support related to improving education. Heather joined the Florida Department of Education and the University of South Florida to coordinate and facilitate statewide efforts for implementing a unified, integrated, data-based multi-tiered system of supports and lead improvements for school counseling, social work, psychology, and nursing. Heather’s work in education included a passion for the multiple dimensions of health for both students and teachers. While working at the Department, she attended the Institute for Integrative Nutrition, NYC, and earned her certification in holistic health coaching. Heather routinely embedded her passion for health into her life and work, opening and closing otherwise conventional meetings with yoga and mindfulness practices and sharing strategies with her team on healthy work/life balance. She became known in her career for a quirky fixation on natural living, wholesome eating, walking meetings, and yoga breaks. The Department featured an article on her healthy routines and coworkers sought her advice and support daily. Heather now devotes her time to providing health coaching and education in contribution to the food revolution. Her interest is in improving our society’s kitchen culture and our relationship with food, our bodies, and the planet. Heather’s integrative approach provides her clients with the crucial connections between the dimensions of health, life and happiness. Sallie Dixon is an Advanced Student with the East West School of Planetary Herbology. Studying traditional energetic systems including TCM, Ayurveda and ‘Western’ approaches to the uses of plants. The EW program integrates plants and diagnostic tools from multiple traditional systems. An avid learner, continually expanding and enhancing her formal schooling, Sallie attends conferences, symposiums, workshops and webinars from a wide variety of nationally and internationally known practitioners and educators. It wasn’t until 2008 that Sallie began to focus on incorporating plants into her life after an acupuncturist recommended herbs to improve her health and encouraged her interest. Since then plants have become an integral part of her life – and her family’s – both as food and medicine. She also utilizes energetic principles and herbs to treat her horses, dogs and cats. Sallie maintains a limited clinical practice in the Tallahassee area where she works with people from a nutritional and lifestyle perspective, incorporating herbs as appropriate for the individual and their constitution. She lives in rural Gadsden County near Tallahassee and enjoys tending an unruly collection of herbs and other plants.